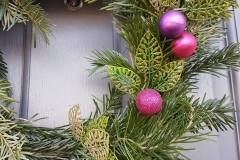 The Crafty Lass does… Christmas wreath! 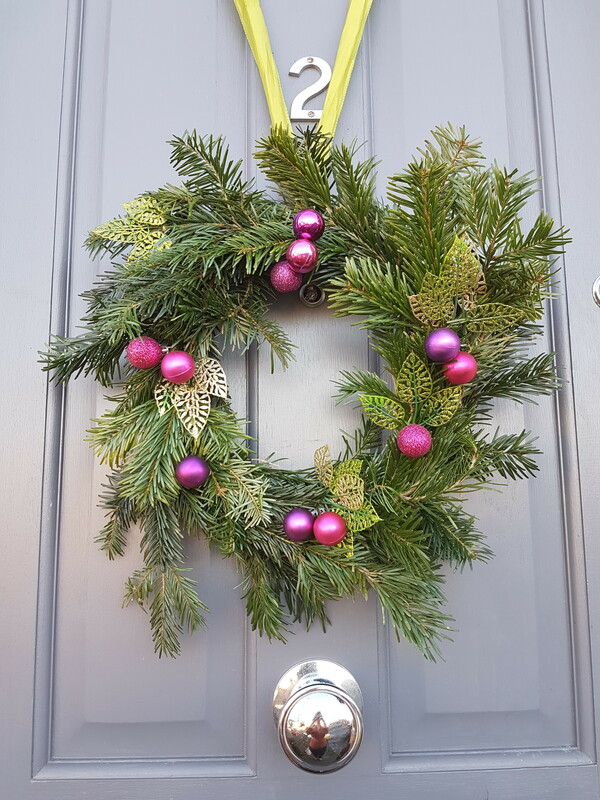 I could have a wreath on my door all year round and with so many ideas and crafty ways to make your own whatever the reason or season, why not! However, certainly when it is Christmas, for me it is a must – and something I look forward to making every year. 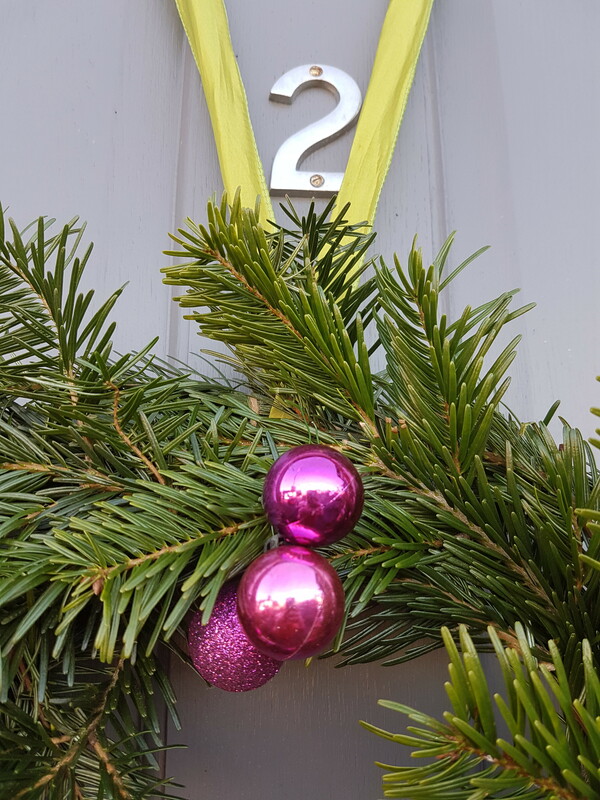 It provides a festive welcome at the front door, and if anything it certainly screams to the outside world – we are good to go for Christmas in this house! 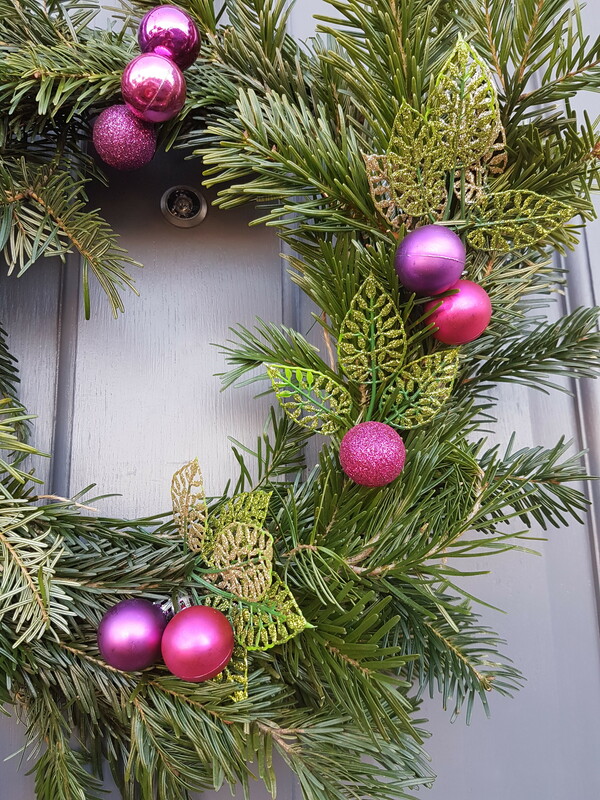 Whatever your style, whether natural and rustic, or full of glittery baubles, making a Christmas wreath is a lovely way to release your creativity and spend a few peaceful crafty hours making something special – and, I managed to do just that this morning. The little one had a well timed nap and instead of getting on with the chores that needed doing, I ignored the washing up and piles of laundry and decided to get the festive season crafting underway! 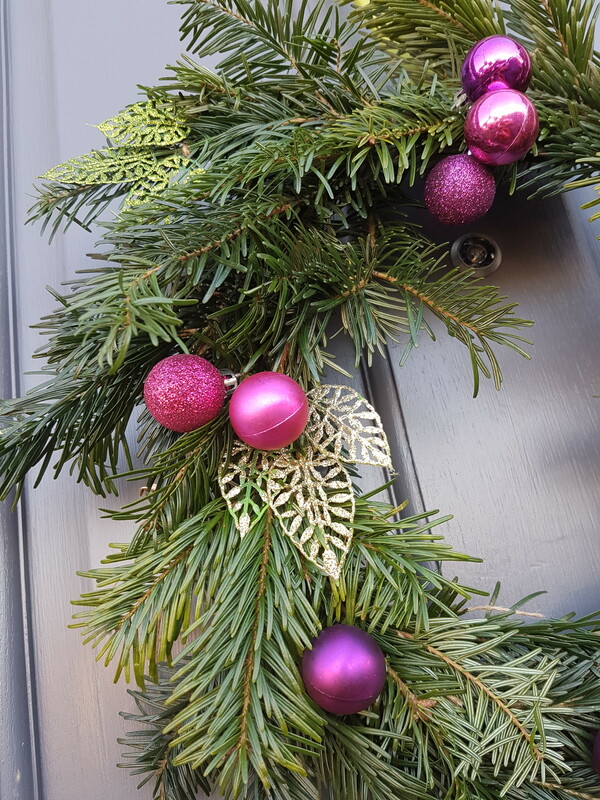 With ‘Jamie’s Cracking Christmas‘ for company and using a plain wire wreath as the base, I decided to go for traditional fir – with a modern twist! 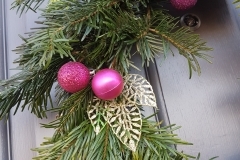 I added in small sections of real evergreen fir tree – simply attached with some thin wire and hessian twine to secure into place. I’ve kept the ‘direction’ of the fir going in the same way, to provide a flow of the evergreen and appear like one continuous circle. 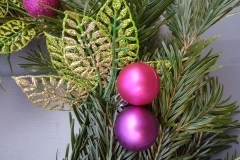 Then, to ‘jazz it up’ a bit – I have added in some glittery leaves, and some hot pink baubles to represent berries – perhaps not everyone’s taste – but I think it looks quite nice to have the combination and contrast of both modern and traditional! 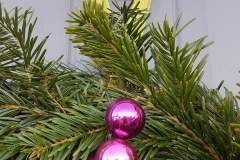 You can usually purchase evergreen fir from your local florist, or – if you are lucky (like me on this occasion!) your local Christmas tree seller may just have some spare – and (if you bat your eyelids!) give it to you for free! 🙂 The wreath bases can be bought from retailers online, or again perhaps your local florist may stock them – then, let your imagination go wild with what you want to add on! Cinnamon sticks, pine cones, dried orange slices, or perhaps some other bigger baubles, candy canes, ribbons and bows, glitter… Of course if you are hanging outside the only thing to remember whatever it is, might not fair well in the British winter weather – so don’t expect to get it back in perfect condition! 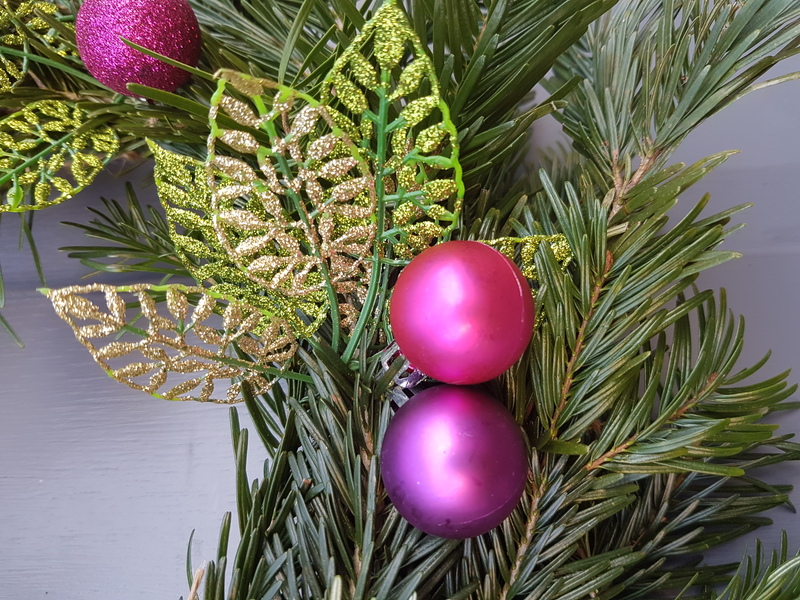 I would love to see what wreaths you have been making this year, so please send me your photos over on The Crafty Lass Facebook page – it would be great to see your wonderful creations! Oh… the ‘C’ word. The one that no one wants to mention. Well, not until at least December is here anyway. Me? I LOVE Christmas. I love the cold weather, the roaring fires, the indulgence and fun and high spirits. Normally, I am prepping WELL ahead of December. Usually there is a handmade advent calendar, and table decorations and handmade crackers on the go. Wreaths are being designed and made, shopping lists written, Christmas cards written, recipes being organised. This year? No. I have done very, VERY little. It’s not for want of trying – I just can’t believe the magical festive season is nearly upon us! The arrival of the (brilliant) John Lewis advert was a shock. What do you MEAN it’s nearly Christmas?? I do have a great excuse though… I have been so focused on our new little one, and even just what day of the week it is, that well, Christmas, and planning for it has gone slightly off plan. My days – that would normally around this time of year – be filled with planning the perfect mince pie recipe or working out just how many gold baubles does a girl need for the new colour schemed tree? Have been swapped for planning the perfect nights eat and sleep routine and counting how many nappies in a day. Times, have, changed. I’ve got some of the priorities sorted anyway – Santa knows what bubba would like under the tree and even our little doggie has his gifts all sorted! Our dog even has a (rawhide) advent calendar himself this year… and a dog BEER. Yes, you read that right. I am one of those people that buys the naff Christmas items at the Pets at Home till. Apparently it is not really ‘beer’ – pretty sure it is chicken flavoured water or ‘moisture’ as the label attractively lists on the ingredients! The Husband was NOT impressed at first when I showed him – ‘What gave you been buying now? !’ – however, I think he is secretly excited to have a beer with his four legged pal on the ‘big day’. Talking of The Husband – he does NOT have any presents… yet, and there is a general shopping list in the go… I just need to action it, and perhaps work out how to get the pram and car seat adapters to actually fit together and man up and attack the shops. Or, just crack on with 3am online shopping. God bless the internet! So, my new focus instead of Christmas and all the wonderful things it brings (mulled wine, aforementioned presents, and our lovely family – in that order! 😉 ) is our little man. He is now 6 weeks old. Amazing. But, where has that time gone?? We have just been treated to his wonderful first smile, and as most babies at this developmental stage – he just LOVES lights! So, we need to get our Christmas tree up ASAP and I plan to simply COVER it with lights – he will be mesmerised. And, I am sure this will bring plenty more delightful smiles. They literally make my heart melt, and me cry. Bloody hormones! 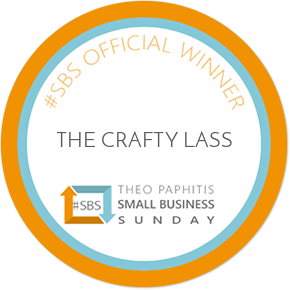 Anyway, enough about me and – if unlike me, you have time to start making anything (there is no doubt I will… I can’t NOT have a crafty Christmas, I’m The Crafty Lass!) here are my top 10 Christmas crafty links for you to try, with a little something for everyone! And, if I don’t manage to post again before – have a very merry Christmas and a happy New Year! How about this for a simple, but very effective craft! All you need is ribbon, and plenty of baubles to make a bauble garland! Beautiful. I’m going to put this out there – I HATE advent calendar chocolate… Now you can get seriously luxurious calendars and they don’t all taste like plastic like they did when I was a kid (please note a Hotel Chocolat advent would be lovely, thanks Husband) – but why not countdown to the big day with doing something different everyday? Here is the ‘Ultimate Advent Activity List‘ to give you plenty of festive ideas to get into the holiday spirit! Just how cute are these clothes peg snowmen! Something you can make together and you could even use them to hold up any Christmas cards received! Love crochet? How about making these amazing elf slippers! 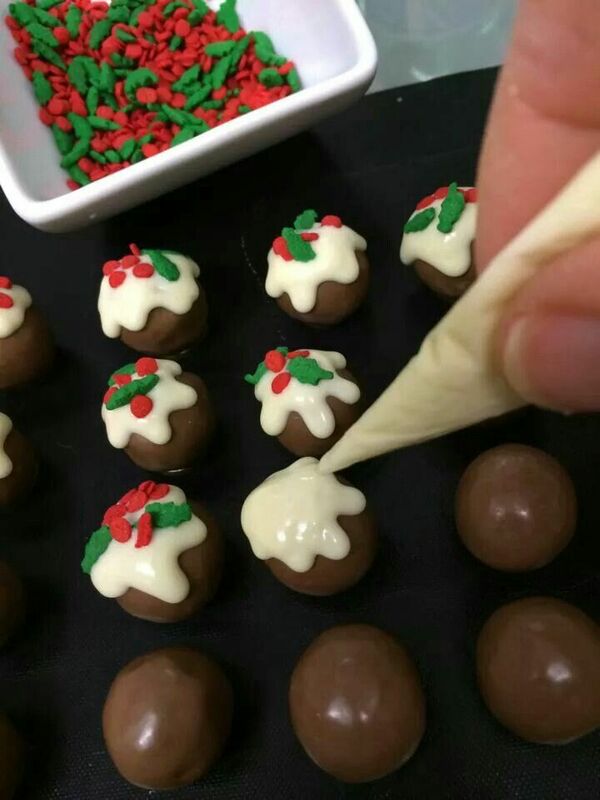 Give everyone a surprise and a smile with their after dinner coffee – and why not turn normal ‘Malteasers’ into mini Christmas puds?! Simply pipe on melted white chocolate, and decorate with small coloured icing/toppings. Clever! If you don’t fancy the traditional fir tree – why not make one out of cardboard? Yes, you read that right – cardboard! This clever link shows you how to make a ‘stackable’ tree! A really lovely idea for (believe it or not!) decorating PEANUTS into little characters! Paint, glue – let your imagination go wild! These could hang above the fireplace, on the tree – anywhere you want to make that little bit festive in the home! 🙂 You could even drape these around the table as part of your table decor on the big day. Top 15… DIY Advent Calendars! As a child (and still as an adult) I absolutely love advent calendars – every single day opening up the little door to see what was behind and knowing 1 day less till Christmas! I wasn’t even that bothered about the chocolate, I am more a savoury than sweet girl, but of course I still always ate it! That weird ‘advent calendar chocolate’ that tastes bit like plastic, you know it is rubbish – but you eat it anyway! You can of course get ‘luxury’ calendars – that are filled with the highest end of beautiful Belgian chocolate, or even different little gifts, and on this slant – how about making your OWN and choosing your own little delights to put inside! I did this a couple of years ago for The Husband – all together now – awwww – I put a little chocolate in each one, and also a task for the day! Like, “Learn how to say Merry Christmas in 5 different languages” or “Lets make mince pies tonight!”. I know, too cute. It was certainly fun to put together, and although The Husband doesn’t like Christmas as much as me – he isn’t a bah humbug scrooge – but he certainly isn’t like Elf from the movie like me – he did really love it. Who wouldn’t love 24 little parcels to be opened up!? On that note… here are my Top 15 advent calendar ideas! Normally I only do a ‘Top 5’ but there were so many inspirational ideas out there, I had to share them with you! A beautiful little advent street – and again, this lovely idea from Mr Printables – does exactly as the name suggests, provides free printouts! A lovely idea simply using envelopes – clever that it is also is in the shape of a tree…! A fun way to turn average stationery into something special! This is certainly a different and contemporary idea – painting jars in colour coordinated paints and popping little gifts inside. Beautiful! What a CUTE elf idea for advent – turning toilet rolls into cutie pie elves! 🙂 These would be cute with or without the numbers, a great Christmas craft for a snowy Saturday afternoon. Not just for hanging up the washing – turn clothes pegs into your new advent calendar! Simply tie little gifts up with ribbon and hang on! This is really beautiful. Love the cute little Santas holding their present sacks, ready for you to fill with a little chocolate or gift – lovely. Everyone loves abit of bunting! How about turning it into an advent idea with these cute boxes! A really clever idea using embroidery hoops to create a little wall display idea as little fabric pockets! Fun!